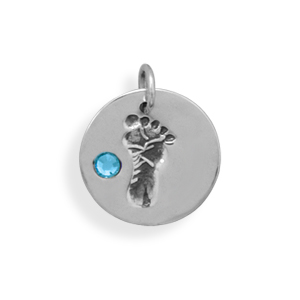 This brand new charm makes a wonderful gift to commemorate the birth of a baby boy! This disc shape charm is a solid genuine stamped .925 sterling silver charm measuring approximately 14 millimeters and it features a baby footprint design with a round 2.5 millimeter bright blue crystal! 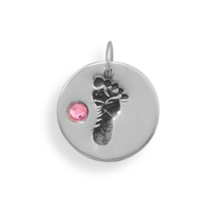 This charm is also available with a bright pink colored crystal to commemorate the birth of a girl. We carry over 900 different charms so if you haven't found the charm you've been searching for be sure to contact us for the link to our daily updated discount catalog to view our entire collection!